Shares of the two high yielding mortgage REITs were down more than 2% on Wednesday after the Federal Reserve said it will continue to taper its third round of quantitative easing. Shares of Annaly Capital Management (NYSE:NLY) and American Capital Agency (NASDAQ:AGNC) fell sharply after the Federal Reserve announced on Wednesday it will keep short-term interest rates near zero while continuing to taper its monthly purchases of long-term bonds. Although the news on the short end of the yield curve is positive for the two companies, as they borrow at short-term interest rates to finance massive portfolios of agency mortgage-backed securities, the same cannot be said for the Fed's decision to further reduce its monthly bond purchases. The reason for the latter is simple. As the Fed's open market purchases slow, the interest rate on long-term bonds will increase. And as the interest rate on long-term bonds increases, the price of the securities themselves will decrease, as interest rates and the value of bonds are inversely related. These forces create an unhospitable environment for mortgage real estate investment trusts like Annaly and American Capital Agency, both of which hold copious amounts of agency-backed paper in their multibillion-dollar portfolios. 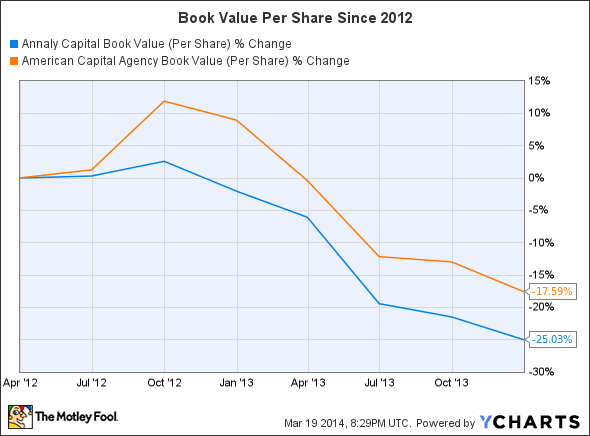 Lest there be any doubt, the following chart shows the destruction this has wrought on their book values per share since the beginning of 2012. So, what's in store for Annaly and American Capital Agency going forward? That's impossible to responsibly predict with precision. However, one thing we can say is a rising interest rate environment will be painful for mortgage REITs. And the other thing we can say is it appears as if interest rates will be on the rise here for some time.